. . . Chris and his pipe were inseparable, and he soon discovered that he did not need to worry about running out of pipe tobacco, as a Chinese product was available in the local tobacco shops. According to him, and he was finicky, it was acceptable in taste. 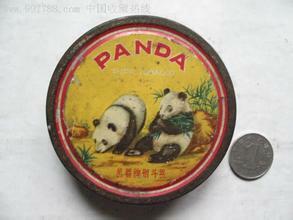 I have mentioned earlier that the brand name was peculiar: Panda. However, what really elated Chris was the discovery of Cuban cigars in one tobacco shop in Wangfujing, still Beijing’s most prestigious shopping street. China was a nation of smokers then. It seems as if more than 90% of the Chinese men smoked. However, they smoked only cigarettes. Cigars were only seen hanging from the mouths of a few foreigners. The appearance of Cuban cigars in China was the result of one of those product swaps, called barter trade in economic jargon. Like the bananas, they were very reasonably priced, according to Chris and his fellow smokers. I wonder what Chinese goods were swapped for those cigars. It served the few members of the political elite who smoked cigars, and quite a few diplomats appreciated this barter deal as well, obviously. From the day of that discovery, Chris had a steady stash of Cuban cigars in our room. . .
Less savoury was Chris’ habit to drop the ashes of his pipe and cigars behind the radiator of the central heating at his side of the room. I remember noticing it, but somehow it did not register in my mind as a point for attention. At least I have never made a point of it to suggest that Chris may remove some of the ashes now and then. Sharing the same shade of grey with the cement floor, it was hardly invisible, but turned up when my later Chinese roommate started to sweep the floor: an activity that had never come to my or Chris’ mind. . . Right when the list of dynastic histories that I had not yet gotten my hands on was getting very short, I found another objective for my book buying addiction: bilingual dictionaries.
. . . It started with an incidental purchase of an Anglo-Chinese Chemical Dictionary in a second hand bookshop, published in 1963. That volume had an indirect relationship with Chris’ Cuban cigars, as the second hand bookshop was located in the same corner of the Dongfang Market. Dongfang Market used to be called Dong’an Market, before the Cultural Revolution, when it was a bazaar of small shops in a larger hall. That change of name is still puzzling, although the old name has been partly restored in the current department store that is now called Dong’an Plaza, owned by a Hong Kong based investment group. . . 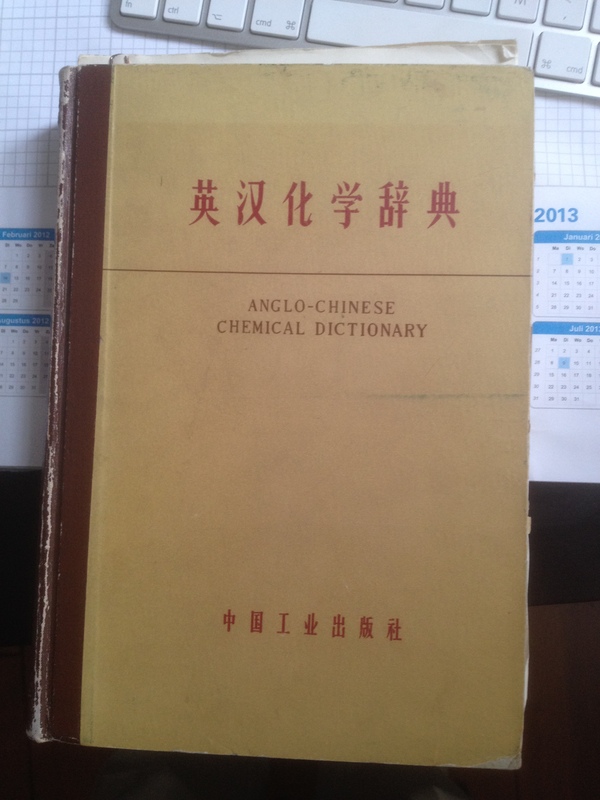 The curiosity driving my impulsive acquisition of the chemical dictionary was no doubt a consequence of the interest in comparing the various versions of manuals in different languages that used to be my favourite pastime in my primary school years. Following that personal tradition, I simply (well, no really simply; it was a huge tome) started reading the book from cover to cover. My purpose was obviously not to learn it by heart. I approached it as a learned observer, with a completely open mind, looking out for any detail that would tell me more about the world of chemical Chinese. . .
Just like our chemical terminology, Chinese chemical terms have a grammar of their own. The bulk of our terms stem from our classical languages Latin and old Greek. When the Chinese got in contact with Western chemistry, they were faced with the complex task of translating the Western terms in Chinese, as Chinese is ill suited for transliterating long Western words. The first Stem, jia, was then used to refer to compounds with single carbon atom as their base; e.g., jiawan for methane. The second part of jiawan, wan, was a partial transliteration of ‘alkane’. A complete transliteration would lead to an un-Chinese expression. The translators transliterated only the core syllable. To distinguish the resulting ‘word’ from the regular Chinese vocabulary, they coined new characters for these terms. The character for ‘wan’ in jiawan was coined by combing an existing character ‘wan’ meaning ‘to finish’ with the character for ‘fire’. Many chemical processes involved heating, so ‘fire’ was frequently used in these new, chemical, characters. Based on jiawan, related terms like yiwan ‘ethane’, bingwan ‘propane’, etc., were formed. Once you had grasped the basic process, mastering the analogous terms was relatively easy. Once I became hooked on studying dictionaries, I aimed my book radar to more of them, opening the doors to an equal number of worlds. The dynastic histories came in a fixed number of 24, so I could draw up a check list and see the list of missing volumes gradually shrink, with at the end of the road the hope of having a complete set on my bookshelf. The number of technical dictionaries produced in China not only was indefinite, it sometimes seemed to me that whenever I had purchased another volume, about car manufacturing, intercontinental missiles, international environmental legislation, sugar production, and numerous other fields, several others appeared in the outlets of the State operated New China Bookstores, compiled with the sole purpose to annoy me. Extreme activities like my acquisition of the dynastic histories, or buying up all technical dictionaries I could get my hands on, offered an opportunity to learn how people from that other culture perceived those actions. When a young Chinese man would pay for a copy of an English – Chinese Aeronautics Dictionary, the clerk at the payment counter would probably presume that that person was involved aeronautics. In view of the rather young age, you could further assume that the customer was a student. However, a young Westerner buying five, six, or more, dictionaries of very different realms of science and technology was a more challenging subject for such conjecture. I could have been assumed to be a student of Chinese, which was true, but that would not account for that broad interest of technology. Who would be studying the cultivation of tea, building bridges, organic chemistry and electronics simultaneously? A super genius? I may actually secretly have regarded myself as a kind of genius then, but I would not have acknowledged it, had someone confronted me with that idea. Dealing with the puzzled looks of book sellers was only one of the problems I was facing. An even more urgent problem was a logistic one. Our room was too small for all those books, and I would not be able to carry them home in my luggage either. So I soon started sending books home in standard packages. As soon as I had enough for such a package, approximately the size of four shoe boxes, I carried them to the campus post office (yes, we had that as well), and sent them home. . .
. . . Saturday, November 1, 1975: Chris’ birthday, in the Fengzeyuan Restaurant. The Fengzeyuan (‘Horn of Plenty’) Restaurant was one of Beijing’s ‘old names’, the Chinese expression for a popular restaurant that has been operating for some time. It served Shandong cuisine, which has been one of the main cuisines influencing the palates of Beijing residents. . .
Chris should be credited with the idea to save such a famous and good (we all seemed to have a liking for Shandong cuisine) restaurant for birthday parties. We were checking out many restaurants and although there were enough in Beijing to eat in another one every single day, we gradually drew up a mental list of favourites that we would visit more often. However, the Fengzeyuan Restaurant was so good, that we did not want to spoil the experience of eating there by visiting it too frequently.
. . . My diary does not have a complete list of guests of Chris’ birthday party, but I believe I can reconstruct it from other information. The names of British Calvin and Kalli turn up at the end of the entry for that day. Calvin actually was my classmate who was living a few doors down the hall of our Dutch room. Chris studied in London and felt a natural attraction to all British students, but he had a particular liking for Calvin. Calvin was a quiet person. As a student of Chinese he obviously had an interest in the country, but could also be at times rather critical. It were the motivated critical remarks that Chris appreciated in Calvin and Chris spent many evenings in Calvin’s room, chatting about whatever they had their common interest. Kalli was like that too, but expressed himself in a more humorous way, often tending towards sarcasm, a style that Kalli shared with me. So, the four of us formed an ideal group of diverse people who had enough in common to enjoy one another’s company. Ronald and his wife were invited as well. Ronald was looking after us as well as could be expected, in that he stayed in touch without being intrusive. By that time, Ronald had also learned that he occasionally had to invite us separately, because that would allow him to discuss different aspects of China, depending on our fields of specialisation. . . So it most probably was a dinner for six: Chris, Calvin, Kalli, Ronald, Sarah, and me. In those top restaurants, it was common practice to book for a certain amount per person and leave the choice of dishes to the cooks. It would always be a perfect balance of meat, fish, vegetables and staple foods. A typical amount was RMB 10 per person. Most restaurants would laugh at you, when proposing such a price today, but in those days it was more than enough for a feast. . . However, the apex of the dinner would be alcoholic beverage you ordered. Chinese alcoholic drinks, at least for such formal dinners, came in three types: beer, rice wine, and spirits. The latter, spirits, would be the regular choice for a really formal dinner. Beer was a newer product in China and, however famous the Tsingtao Beer may be, still a foreign beverage. Rice wine was mainly consumed in the region around Shanghai, heated au bain marie. We often ordered it in winter, because it infused you with a warm feeling from the inside instantaneously after the first sip. But not for Chris’ birthday. That was an occasion that could only be celebrated with the crème de la crème: Moutai (sometimes spelled: Maotai). Moutai is distilled liquor made from sorghum. It is very fragrant with an alcohol content of 53%. The first moment after your first sip of Moutai is experienced as rather pleasant by most inexperienced Westerners. However, soon after that initial experience the burning sensation starts, from your oral cavity to all other parts of your digestive tract, down to your stomach. This is why Chinese will only drink their spirits during meals, when your stomach is lined with protein and fat. It is also the reason for not savouring it like wine in Europe, but throwing it down your throat from very small glasses, like shots of Tequila. . .
Chinese often combine beer and spirits. You can then use beer as a chaser for the spirits.
. . . Chris became a victim of that peculiar chemistry during his own birthday party. The final part of the entry in my diary of that day says that Chris was so drunk that Calvin, Kalli and I had to drag him out of the taxi and carry him all the way up to our room on the top (third) floor of the dormitory. . . There was a small bonus for Calvin, Kalli and myself too. It would not surprise me, if we burned up most of the calories we had taken in during that dinner by getting Chris safely to our room. . .
Well, as you can read, we were quite successful in our attempts to emulate European student life in Beijing back in 1975. Obviously, we had to show that we had come out of our work in the commune as better people. We did so by writing reports, and making short presentations. We also receive a couple of group photos, one of which has been used in the previous post.
. . . A conspicuous entry in my diary of October 24, 1975 is printed instead of in my regular handwriting: CHANGE OF TEMPERATURE. . .
Beijing has a typical continental climate. Although located on roughly the same latitude as Naples, Beijing’s winters are greatly colder than ours, while the average temperature in July and August is at least 10 degrees higher than what I am used to. The air in Beijing is extremely dry, except for a period from mid-June to mid-September. This is not only reflected in the low precipitation, but also in the ever present static electricity, which makes shaking hands, hugging and especially kissing, acts that require some preparation, lest they end in painful screams from both participants. . .
Beijing winters are harshly cold. It can start freezing in late November and sub-zero nights are still possible far into March. Spring is pleasant, but remarkably short. One day you are still wearing a sweater, the next day you need to take it off, and it is as if the following day you need to get your short-sleeve shirt out of the wardrobe. Moreover, spring is the season of the dust storms that transport fine loess soil from the Gobi Desert to Beijing and beyond. A mouth full of dust is more unpleasant than an electrifying kiss in winter. Autumn is the season most people like. In the previous chapter I mentioned the pleasant weather during the week of Open Door Schooling, and pointed out that Western politicians are aware of that as well, which explains the high number of political delegations to China during the fall. It starts late September and continues up to mid or November. Owed to the arid climate, skies are usually blue in Beijing that time, providing ample sunshine. . . This was probably the period in my year in the Beijing Language Institute that I left campus the least. I intended to get the most of that opportunity and believed that class room studying was the best way to attain that goal. Cycling became less pleasant with the lowering of the temperature anyway. 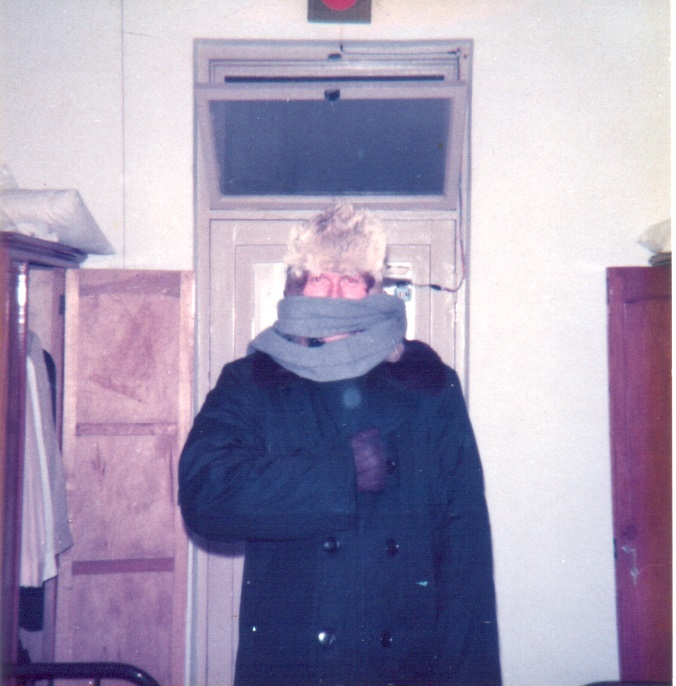 It was time to prepare for winter.
. . . A padded coat was needed to make it through the Beijing winter. Entries at several places in my diary witness the quest for such an item. The school had announced that coats of various sizes would be available in the small campus shop, stubbornly referred to by Teacher Bi as ‘The Canteen’, some day. However, many those announcements turned out to be empty promises. The language of my comments in the diary becomes gradually harsher, each time we went to the shop in vain. However, one day the padded coat was finally hanging in my wardrobe. It was blue, but then blue, and green were about the only colors one could see on the backs of people in the streets of Beijing that time. It was also quite heavy and clumsy to wear, but it was surely warm, and most of us were happy to have one, although we would wear it only a few months, from early December to early March. . .
. . . I had developed peculiar habits of my own that probably invoked similar feelings among my most intimate friends at the Beijing Language Institute. The first was my almost hysteric purchasing of the Dynastic Histories that started to appear one by one around the moment of my arrival in Beijing. After the first real historic book in Chinese History, Shi Ji, usually translated in English as “Records of the Grand Historian,” had been written in the first century B.C., it became a custom during the following consecutive dynasties that each dynasty would take care of writing the official history of the previous one. Historiography has remained a serious business in China, up to the present day. Each time a new faction rises to power; it will rewrite the history of the previous period. The historians are not required to be totally factual. They are supposed to add their personal comments about the role a particular person has played in history. If a historian believes a certain person; e.g., a minister, has played a positive role, that minister’s activities and personality will be embellished. Others who are deemed to have had a negative influence, will be portrayed as thoroughly evil, even in their childhood. This is known as baobian in Chinese, a compound of bao (to praise) and bian (to criticize). . . I was helped by the current political campaign that included criticism on Confucius.
. . . Some people in Europe use the term Maoism, but Chinese refer to the Great Helmsman’s ideas as Mao Zedong Thought. Mao Zedong had written books, essays, and poems. You had to read, analyze, and internalize his entire oeuvre, if you wanted to understand his ideas. Revolution was not merely about emotion, but an intellectual endeavor. Marxism was a philosophy and an academic model of the development of human civilization. All this led to the emergence of a the Criticize Lin Criticize Confucius (Pi Lin Pi Kong) campaign, a campaign against a Communist general who had played a crucial role in the quick victory of the Communists over the Nationalists after the Japanese surrender in 1945 and one of China’s earliest philosophers. If Lin Biao had still been alive, he probably would have felt honored. He wasn’t. To launch a nationwide campaign to criticize the general and the teacher, many classical books were re-edited with great gusto. They were sold from special shelves in the bookshops, designated as ‘material for criticizing’. . . There was a practical problem. Our small room was not big enough to store all those books. So I soon started sending them home.
. . . Luckily, we had a small but efficient post office in the Institute and after patronizing the bookshops in Haidian and some in the city center; I probably became the most loyal customer of the post office as well. It was very efficient indeed. That post office also functioned as a kind of Customs Office. The girls leafed through all books, and put a little red OK stamp on the first page (a nice souvenir distinguishing the books I bought that year from the other Chinese books in my library). I started to send sack after sack. Books were packed in jute sacks, sealed by sowing it with a white plastic thread. It looked horrible, like an endless stream of Santa Claus bags, but all books arrived safely. . . I have taken the liberty of jumping to the chapter describing our Saint Nicolas activities in 1975 in my previous post. 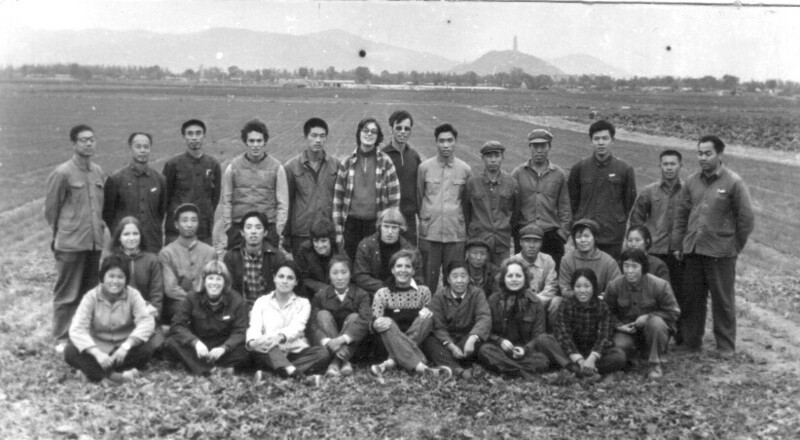 I will pick up the story again which brings to what I still consider a major event during that year in China: spending a week in a People’s Commune in October 1975. One morning, during the regular language class, the arrival of a Vice-Director was announced. She would convey an important message. We immediately got curious. She had already built herself a reputation as a bit of a revolutionary, though of a rather sympathetic type. When we were shown a documentary film about the first female team of mountaineers (Chinese, obviously) to reach the top of the Mount Everest, she stood up from her chair and cheered. . . .
That day she entered the classroom radiating with her usual enthusiasm, but we could also sense a solemn undertone in her appearance. Our group had been selected as the first group to spend an entire week in a people’s commune. Now that was news. Even the politically most skeptic of our group lightened up. This was something we had to share with the other, less fortunate, students during lunch. We had heard and read so much about communes, already in Europe, but so far we could only try to imagine what life in a commune was really about. And sometime in October we would learn all about it first-hand. Different types of fellow students reacted differently to this news.
. . . The most peculiar reaction probably came from the leftist Westerners who had worked hard to be able to spend that year in China and learn about the fruits of the revolution first hand. The news that we were going to work in a commune, if only for a week, suddenly attracted new friends in the dining hall that central location of our social life. A Swiss student who let no occasion go by to testify of his leftist ideology, got very upset about my announcement. His first reaction was: ‘then you need to prepare’. . . . The Swiss student would remain my loyal tablemate in the dining hall until the end of the week in the commune. The guy was so eager to learn every detail of our preparation and on the spot experience. I gloated in that attention. I used to keep his fire alive by feeding him tidbits of information, but also made sure his curiosity would remain high, by leaving out important details. . .
From that day on, most of our courses would be adapted to prepare us for our week in the countryside.
. . . The morning language lessons from then on were dedicated to our work in the commune. We were taught agricultural vocabulary, like names of domestic animals and crops. The latter was regarded as especially important. In cultural revolutionary terminology, urban residents before that revolution were described as people who consumed grains, but could not recognize the various cereals when growing in the field, or using a classical expression (you see, you need some knowledge of Classical Chinese, even for a better understanding of the most revolutionary terminology!) wu gu bu ren ‘unable to distinguish the five (types of) grain’. To repair that, we learned the words for rice, maize, wheat, oat, and other staple crops, and were shown pictures to be able to recognize each, when pointed out by a commune dweller. This has affected me more than I probably would be willing to admit. For example, when I travel by train in the Netherlands, crossing an agricultural region during the growing season, my mind automatically starts trying to recognize the crops growing in the fields passing my window. I am rarely actually able to name a particular crop, but at least I make an effort. Hats off to the training of the Beijing Language Institute. Our first period of Open Door Schooling started on Monday, October 20, 1975. It took the bus a little over half an hour to reach the Si ji Qing (‘Four Seasons Green = Evergreen’) Commune. As expected we were taken to a kind of model commune, one that served the citizens of Beijing with agricultural produce. The fertile soil was easy to till and with the leaders of the nation as part of your clients, you needn’t worry about the continuity of your existence. The mornings of those six days in the commune were spent visiting, while we worked in the field during the afternoons. We took our breakfast in the Institute’s dining hall, but had lunch in a farmer’s home.
. . . We were split up in smaller groups for lunch, and each group was walked to its designated host family. I was grouped with a couple of Canadian classmates. Apparently, none of them have been impressive enough to make me remember their names. Lunch was already on the table, when we arrived, prepared by our school cooks in a central kitchen. The lady of the house (we never met the lord) was always in during lunches that week, spending much time with her young son that would have been about a year old. She did not share in our lunch (‘I have already eaten’, attentive readers know now that that is a standard reply), which she apparently really regarded as ours. I got the impression that she did not even have to do the dishes, and that all bowls, plates, and chopsticks were cleared away after our departure. In fact, however exciting our visit must have been to our hostess, our lunches must were an intrusion into the regular commune life. The income of Commune members was calculate using a kind of piece-wage system in which they were credited work points for a certain type of work. Those work points could be exchanged for staple food and cash. . . Strengthened by the lunch, we were ready for physical labour.
. . . Participating in farm work was regarded a key component of our Open Door Schooling experience. We spent most of our afternoons in the field. We were lucky that this event took place in October, when the temperature was pleasant, and that it was Beijing, where most of the rainfall is concentrated in July and August. The air of Beijing is arid most of the year, except for a short period between mid-June and early September. We thus spent six afternoons doing farm work with afternoon temperatures of 16 –18 degrees and no fear to be caught by rain, or getting soaked with sweat. . .
. . . We were not given a chance to get tired. There were many breaks and we were supposed to make conversation with the farmers who were assigned to our group. After all, this was part of our lessons and it posed a fine opportunity to interact with another type of people than those that we met regularly on campus. Moreover, we did not earn any work points as well, even though we contributed to the total work flow of the Commune. . .
We took are dinners in the school again.
. . . Wednesday started with an introduction of the history of the commune. That was a solemn expression for an institution that had come into existence less than 20 years earlier. However, the Chinese, a history-conscious nation, are masters in creating a history for everything. I have regular contacts with a university in Beijing established in the early 1950s, but they could trace their history back 20 years earlier. The commune’s history started with the land reform of the early revolutionary days, continuing with the various stages of collectivization, like the ‘mutual help groups’ of the mid 1950s, to the establishment of people’s communes. From a geopolitical point of view, communes were not newly invented. They were based on existing townships. The lower level units of communes, production brigades, and production teams were also based on natural villages. . .
. . . That afternoon, I remember an interesting remark from a lady about whom I only recall that she was something in the Commune’s leadership. She pointed out that onions were not a staple, or a major food group, but they added flavor to food, like garlic. It was necessary to grow them, so the people in Beijing could enjoy tastier food. That remark has several shades of meaning that may not be apprehended immediately by old China hands, or even young Chinese. Even before the Cultural Revolution, much emphasis was laid on growing cereals, to serve the objective of making China independent of foreign resources. This had led to several disastrous mistakes. Soil that was not suitable for growing wheat was still designated for that purpose by local satraps who wanted to make themselves look good at the higher administrative level. Hence, the original crops grown in those regions for ages were discontinued, but the wheat crop turned out to be disappointing, at least. The local rulers were too embarrassed, and afraid for the repercussions, to report that, so they still filed ‘bumper harvests’ (another Chinese expression with a heavy underlying meaning) with their provincial governments that consolidated the fake output figures in the provincial report for the central authorities. If this had only been a game of figures, the problem would not have been so enormous. However, the grass root level area with the low wheat output was then requested to submit a certain part of the harvest to the government. The rule then was that each administrative unit would keep a certain percentage of the agricultural output for its own local consumption and hand over the remainder to the State. Many regions ended up with no staple food at all, and sometimes the entire harvest of the year was insufficient to fulfill their duty. The local leaders thus had to resort to borrowing, buying, or whatever way they could think of, to obtain sufficient wheat.
. . . That day we did not go back to the fields right after lunch, but first visited a so-called ‘old intellectual youth’(lao zhishi qingnian). Intellectual youth was a Cultural Revolution term, referring to urban teenagers who had finished their primary and middle schools and were therefore, regarded as equipped with more knowledge than their rural peers, or even the parents of those peers (remember the art of changing a light bulb mentioned in the beginning of this chapter). Mao Zedong had therefore, launched the idea that those intellectual youths should spend some time in the countryside, before pursuing a career. That would allow them to share their knowledge with the local farmers, and get a personal experience the frugal life of the peasants. Once you had settled down in your rural village, in practice your main concern would be how to get back to the city as quickly as possible. For most of these youngsters it would take a few years, as mentioned earlier. However, some of them really grew roots in the countryside and integrated as full members of their commune. Those people were called ‘old intellectual youth’. My main memory of that visit is that his house (like during our lunches, we did not see any other family members) was rather dark. I also noted that he did not really engage in farm labor and worked as a clerk in the commune office. It makes sense that an ‘intellectual youth’ would be useful there. Saturday was the final day.
. . . We spent the morning with the leaders of the commune and a few representatives of common members, asking questions. That was yet another recurrent part of official visits during that year, the final bout of questions. The experts in this field were again the leftists, and they used a jargon of their own. E.g., they did not ‘ask’ questions, but ‘raised’ them. When you want to know the time, you are asking a question, but an inquiry into the procedure of decision making or the say a common commune member had in the commune’s policy was called ‘raising questions’. . .
. . . The day ended with the final obligatory item: the performance, the jiemu, a practice we first encountered during the National Day celebrations in the parks. It translates as ‘program’, but is one of those terms referring to a ritual in Chinese social practice, which is more complex that than the literal English translation may indicate. It consists of several songs, dances and other performances by one or a small group of persons. At least a few, but usually all, acts have some sort of political purport. The habit still exists, but the contents are much less political now. Moreover, sometimes, when looking carefully, you can see a hint of sarcastic criticism hidden under an outer skin of political correctness. We got home early that day, we still had a kind of Saturday afternoon feeling. The Saturday dinner in the school dining hall ended that eventful week. So what about that Swiss student? What about him? He lost his interest in me immediately after that day. As December was approaching, the weather really turned cold, with sub-zero temperatures almost every night and more and more of the days. The skies were still mainly blue, creating that typically crisp Beijing winter feeling: the combination of a harsh freezing wind and sunshine on your face. The heating systems were turned on mid-October. Central heating was really central in China those days. A building as our dormitory had a boiler burning coal that was regularly replenished by a couple workers with shovels from a pile of coal outside the building. That pile in turn was continuously restocked from trucks driving to and fro all day. All buildings in the school and almost all multi-storey buildings in Beijing were heated that way. Some groups of apartment buildings belonging to one organization were serviced by one boiler room. All that coal being burned in city like Beijing created huge amounts of fine black dust in the air that we were breathing. However, we appreciated the heating, although the radiators were usually lukewarm and could be touched with your bare hand without having to be afraid of burning yourself. The dormitories were small enough to be heated to a comfortable temperature. I have never liked overheated rooms anyway, but there was a gap of about two weeks between the beginning of the cold season and the firing up of the heating system. In that period, rooms on the sunny side of the building would get some warmth from sun, but once the sun had set, the concrete buildings often seemed colder inside than outside. Later in the evening, we would fill our mugs with hot water, not so much for drinking as to warm our hands. Classrooms could also be chilly, even after the heating had been turned on. They were bigger and therefore less easy to heat up. The main building as a whole was also too big for such a heating system, although it had a huge boiler room, or better building, as the boiler was located in a separate brick building close by. We would take our padded winter coats off at the beginning of the lectures, but hang them over the backs of our chairs in such a way, that we could easily drape them over our shoulders, when we would start to feel a little chilly, after sitting still for so long, and our bodies had burnt up the calories taken in at breakfast. During the breaks we walked around to revive our circulation, but there were no hot drinks to warm our insides. Towards lunchtime, even I would feel cold and hungry. When noon approached, I would habitually make sure to be one of the first to get up and leave the classroom, and run to the dining hall. Surely, I still did the utmost to do so without being too conspicuous. Being one of the first to enter the dining hall would put me in a position to have the first look at the table of dishes and pick myself a dish with lots of protein and carbohydrates. My favorite was a sizable meatball with a whole egg inside and some green vegetables. I regarded that as one of signature dishes of the Chef. It was also a kind of fusion cuisine avant la lettre, as it resembled a Chinese dish called ‘lion head’, with the hidden egg as a Western addition. This habit of taking three greasy protein laden meals a day already started to affect my waist line. I might have felt hungry at lunchtime, but the calorie intake of the lunch described above would repeat itself at six in the evening. Breakfast usually was a helping of fried eggs and bread. The variation in my diet apparently was sufficient to ensure a proper intake of nutrients; at least I never suffered conditions related to malnutrition. However, the energy all that food contained exceeded my body’s energy need by far. And I have not even mentioned the inevitable snacking. A dorm packed with young male students was bound to have a regular stash of beer and snacks to go with it. Skipping meals was merely a theoretical option. As mentioned before, meals were so much more than simply occasions to eat. The dining hall was the center of our social life. It was the place where we made new friends and reinforced existing relationships. There, we made arrangements for the evening, or what to do in the coming weekend. We did not have mobile phones then and not even landline phones in our dormitories. In our building, there was only one phone, at the counter of the janitor. Phoning within Beijing was free, as far as I can remember. That would not have cost the school an awful lot of money, as we did not have so many acquaintances to call and chat up anyway. We even used snail mail to communicate with the few people we did know. A diary entry for December 12, 1975, states that we received a package from the Embassy by mail. The following day we wrote and sent a letter to the Ambassador’s wife who had sent the package. No, we absolutely could not afford skipping a meal in the dining hall. Obviously, once you were there, even when your main purpose was socializing, you would have a bite and a drink as well. So there you go. Our festive season started early. The winter festivities start earlier for us Dutch than for most other Western nations. We have Saint Nicholas’ Eve (5 December) and Saint Nicholas’ birthday on the morning of 6 December, which has been celebrated in the Netherlands and parts of Belgium for more than ten centuries. This celebration of Saint Nicholas’ birthday has been joined with that of the birth of Christ in the English speaking world, leading to the name Santa Claus for the figure that used to be known as Father Christmas’. We give and receive presents on December 5 or 6, not on Christmas, which is more a time for reflection. Feasting on seasonal delicacies is an inalienable part of both celebrations in Holland, with special types of traditional Saint Nicholas treats, different from those consumed during Christmas. This is a real bonus for being a child in the Low Countries (and long after you have grown up). Just when our bodies have roughly processed the Saint Nicholas goodies, we can start all over again during the days leading to Christmas, all the way up to and including New Year’s Day. The Saint Nicholas celebration was a recurrent headache in Beijing. The Dutch community in China was small indeed in 1975. Except for the Embassy staff and their dependents, there were the odd business people, a few Dutch staff members of UN representations and that was it. 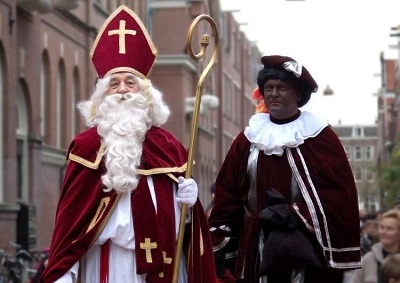 The core ritual of the Saint Nicholas celebrations is that the Saint himself, with his loyal aide Black Peter, visits your home, school, or workplace. The holy man carries his Big Book in which all the good and evil deeds of the children in the family (and many adults) have been kept. Black Peter carries a jute bag filled with presents. The Saint is seated in the family’s most comfortable chair and starts calling the names of the children, and the other family members, one by one, and starts praising or criticizing them. Obviously, all of them get at least one present. In the old days, children with extremely bad attitudes may be given a birch as a symbol for the birching that they deserved. The Dutch, being such a tolerant people, had already abandoned that tradition long ago. For the readers who still have not guessed, both Saint Nicholas and Black Peter will be disguised family members. Each year, it is a real problem to determine who will play what role. It is not that fun to play either role, but surely not the role of Black Peter, as you will keep finding black spots behind your ears, inside your nostrils, or wherever, days after the big event. The next issue is to hide the real identity of these generous gentlemen from the children. One solution is to hire a professional Saint and helper from a temping agency. We have that kind of service in the Netherlands. In university cities, it can be a lucrative side job for students in need of some extra cash. We Dutch are an inventive nation. However, more often people request two persons in a neighborhood to take care of all families in that region. Those families can then share the costs for hiring costumes and gifts for the good volunteers. Our presence was a blessing for the Saint Nicholas celebration. Chris and I have never felt more appreciated during that year than on December 5. The Dutch children, except Ronald’s, had never met us. We were the ideal Saint Nicholas and Black Peter. A flip of the coin decided that I would be the holy man (probably not destiny this time; this was sheer luck, and I am still grateful for it) and Chris my black helper. After just having resigned to our modest living quarters, this was another blow to his self-esteem, but we had used a real coin. We were dressed up in the Embassy. The Ambassador had no children, and the only set of Saint and Peter clothes was carefully kept in good shape in the Embassy. The local staff had grown used to this peculiar Dutch habit of catching an occasional Dutch visitor to the Middle Kingdom, dragging him (or her, when the least known Dutch citizen was female) to the Embassy, putting a ridiculously big white wig on his head, a red miter and cape and driving him to the home of one of the Embassy staff members. The real Saint Nicholas moved around on horseback, but except for the fact that the Embassy did not own a horse, we would probably have gotten into problems with the traffic police, not to mention the enormous crowd a man dressed like that would have drawn; with a man dressed in an equally peculiar outfit, and his face painted pitch black, following the horse on foot. Don Quixote and Sancho Panza Dutch style. Such an occasional visitor needed to be lured with an attractive reward, or sedated to make the embarrassment more bearable. As we had missed the opportunity to negotiate an award, we opted for the latter, taking care of it ourselves. Neither Chris nor yours truly was volunteering for this job. It was presented to us as our holy (!) duty. Unfortunately for the Dutch crowd in Beijing, we were far from holy people. We got ourselves a bottle of one of the ingredients of Peter’s Potent Punch. It was one of the strong distilled liquors named Jinjiu, which literally means ‘Golden Spirit’. It was a simple colorless spirit, so the origin of that brand is just as obscure as the Gold Fish brand for you-know-what. However, it did its job, and both Saint Nicholas and Black Peter arrived at the Embassy in a slightly inebriated condition. No, not drunk, we wanted to express our feeling of protest, but keep up our style. Arrived at the home of one of the Dutch diplomats, we immediately became the center of attention. Saint Nicholas has arrived! The little brats started to bellow, singing those songs the lyrics of which I had happily stored in some backroom of my memory. Already at that age, I was determined not to reproduce myself and have been loyal to that decision up to the present day. It is not that I never enjoy other people’s children, but I have never felt the urge to put one of my own on this planet, obliging myself to invest in it for at least two decades, only to have to endure it leaving me, once it can stand on its own feet. I was also frightened by the emotional ties most people with children that I knew had with their offspring. Finally, you had reached a stage in your life at which you were generating your own income, enabling you to travel wherever you wanted, dress and dine in style, buy your first house, and then you had to give all that up again, or at least slow down, when the first little brat arrived, constantly yelling to be fed and clad. The Dutch little brats were all there, gathered in that living room, screaming with only one thought on their greedy minds: what will I get from the old man. That was already not my favorite environment, but something snapped inside my mind, when Ronald started the ceremony with the wrong question: ‘Saint Nicholas, would you care for a drink?’ I simply had to follow suit with the wrong answer: ‘A young one please’. You have to be Dutch, or someone with some experience with our culture to be able to understand this reply. Our national drink, Jenever, comes in ‘young’ and ‘old’ (aged) varieties. The insider does not ask for a glass of Jenever, but ‘a young one’, or ‘an old one’. However, young or old, the choice of beverage was not a wise one. The contents of the first glass immediately started a cross-cultural negotiation with the local spirits already in my system. The Jinjiu and the Jenever formed a joint venture, half a decade before the Chinese government gave the green light to joint ventures between Chinese and foreign companies. As a real joint venture, it had its upside, and downside. The upside was that, I learned that later, that year’s Saint Nicholas party turned out to be the liveliest since years. I excelled. The downside was that the holy man turned a little obstinate and moody after a few young ones. Ronald tried to play the clever clogs and handed me glass of water, but that was only counterproductive. It made good old Nicholas swear in front of all those innocent little brats. He duly apologized, after receiving a glass of the real stuff. Luckily, the ceremony did not last that long. 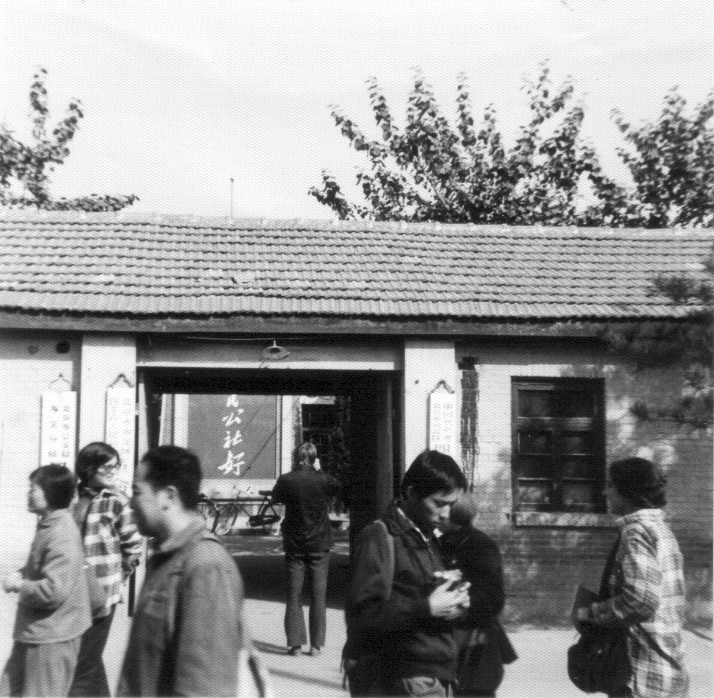 The Dutch colony in Beijing was small in 1975. We were driven back to the Embassy, where the Ambassador, and his wife obviously noticed the merry state of the holy man. They already had decided to let us stay the night, and take us to the Great Wall to that grand monument in winter the following day. That offer to stay had been expressed since our arrival in the Chinese capital, but we, two young men finally completely independent, had been reluctant to accept that invitation so far. Now at least there was a proper excuse not to get into a taxi and return to our dorm. Chris would have had a much harder time in carrying me upstairs than the three of us had after his birthday party not that long before. I obviously turned in early and we did enjoy the Great Wall. It was not our first visit. The school had driven us there soon after our arrival, but seeing it during winter, with a few patches of snow (snow is rare in the arid continental climate of Beijing) was real a treat. It was also the season with the lowest number of tourists, which made the place even more enjoyable. Afterwards, we received, again by mail, packages from the Embassy, gifts to thank us for our services on December 5. My present was a bottle of liqueur; I have not noted the brand in my diary. Mrs. Ambassador had added a handwritten note saying that she ‘had preferred to send something else, but assumed that I would appreciate this best’. These were wise words.